Barocci was the leading painter of altarpieces in Italy during the second half of the 16th century and is widely acknowledged as the greatest painter, after Raphael, to come from Urbino. He spent a few years in Rome, where he worked for Pope Pius IV, but returned to his native city in 1563 due to a serious illness that afflicted him throughout his life and which, although he lived to a ripe old age, restricted him to work on paintings for only a couple of hours each day. Barocci’s principal patron was Francesco Maria II della Rovere, Duke of Urbino, who commissioned him in 1582 to paint one of his most influential compositions, The Annunciation. Completed in 1584, the painting was created for the duke’s private chapel in the basilica of the Madonna di Loreto. The painting was seized by French troops in the 18th century and eventually relocated to the Vatican, while the original chapel setting was furnished with a mosaic copy of the composition. 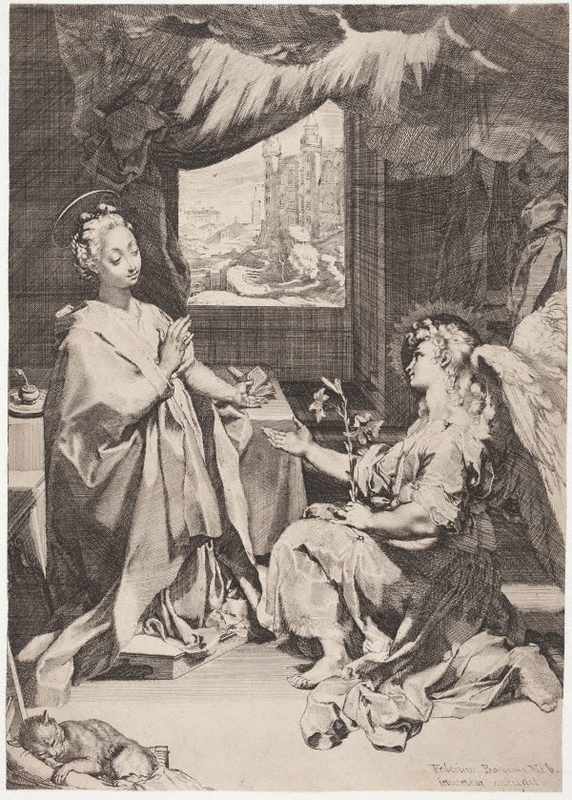 Probably not long after Barocci completed his large altarpiece, he replicated the composition in the medium of etching, preparing it from a compositional study in pen and ink and wash (in the Museum of Fine Arts, Budapest), which corresponds exactly to the size of the print. The print depicts the Virgin kneeling on a prie-dieu, presumably in her bedroom; her writing table, with pen and inkwell, is visible in the background. A sleeping cat in the corner adds a touch of intimate domesticity to the scene. The Virgin still holds the book she was reading in her left hand while her other hand is raised towards her chest to express humility – an attitude supported by her modestly downcast eyes. On the right side the angel Gabriel gestures in salutation before Mary and announces that she will conceive and give birth to the Son of God, despite her virginity. Directly above the sacred figures, divine light breaks through, illustrative of the power of the Holy Spirit overshadowing the Virgin. Barocci relates the miraculous event to his native city by affording us a prominent view through the open window of the ducal palace of Urbino. Doubtless this was intended as a compliment to Barocci’s important patron. on aspiring etchers was considerable. Barocci’s novel use of the medium expanded the expressive possibilities of etching: his proclivity for variegated strokes - long lines of slanted parallel hatching together with cross-hatching and stippling – combined with the techniques of engraving and drypoint, as well as the innovation of stopping out and re-etching to achieve darker lines, resulted in impressive visual and tonal effects that were without compare in Italian prints at this time. The Gallery’s impression of The Annunciation is from the second state, with Barocci’s inscription in the lower right corner. The word excudit indicates that Barocci was the publisher of the plate; as such, he had control over how many impressions were printed and of the profits from their sale. Richard Beresford, Look , 'Mantegna to Piranesi Italian Old Master Prints from the Collection', pg. 14-15, Heidelberg, Jun 1998, p 15. Prints & drawings Europe 1500-1900 , Sydney, 2014, p 34, col illus p 35.